We are big on the 3 R’s of course. But every now and then we have a particularly poignant example. Like after the first month of our Big Push to reduce and we went to only taking trash out every other week -and even then only due to odor, and never due to volume. Today we had another one. Our daughter had a toy that she had broken beyond repair. We use it so infrequently that our 4.8 year old doesn’t even remember where it is! Living Green is a huge thing, taking others with you is even more critical. Our kids don’t watch much TV. Ok, our TV has been unplugged on our basement floor for 7 months and is gathering a nice collection of junk on top. We do watch videos as a family occasionally, and the kids (Sprout just turned 6, and Bird is 4.66) can watch some videos on their own once in awhile as well. 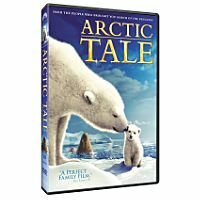 Today we watched Arctic Tale. I won’t get into the morality of burdening a 4 year old with Eco Guilt, but this movie spurred the kids and I to have one of our better Talks about why we do what we do. Sprout is now committed to planting “dozens, and dozens, and dozens of maple trees so we can make our own maple syrup”, and is actually remaining committed after I explained that it takes longer to grow maple syrup than carrots. Thanks National Geographic, for Being the Change.